Custard looks more liquid because of the heat from the torch moments before. Books are not the only place I have searched for inspiration. I have been re-watching my favourite films in case a suitable name lurks within their midst. One such film, Amelie, sadly did not bestow any names deemed suitable to my husband (even though I loved quite a few of the melodic French names) but it did stir within me a craving for one of my favourite desserts, creme-brulee. In a small saucepan, place the cream and the herbs and bring to a boil. Turn the heat off and let the herbs steep in the cream for 20minutes. In a separate bowl, whisk together the egg yolks and sugar. Temper the warm cream into the yolks and whisk. Strain the custard through a fine sieve. Place ramekins on a sheetpan. 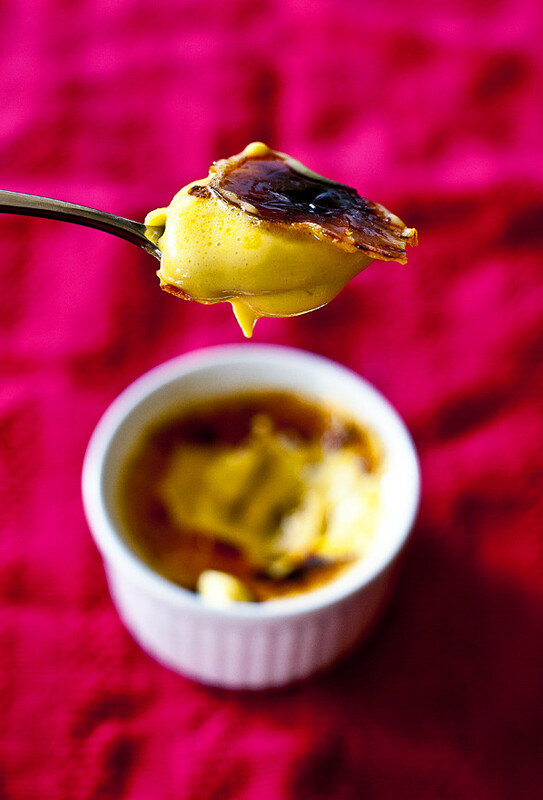 Pour custard into ramekins and bring the pan into a 300 degree oven. Once the sheetpan is on the oven rack, pour some boiling water on the pan to create a water bath. Bake the creme brulee in the 300 degree oven in a water bath for about 20-40 minutes. When lightly shaken, the center should jiggle slightly but not appear liquid. Refrigerate the baked custards for at least 4 hours. Sprinkle some demerara sugar on top and burn with a torch or under a hot broiler. cooking time: 35mins plus 4 hours chilling. total: 1hour & 10mins plus chilling. taste: 4/5. Dainty floral-scented perfection. The floral medley carries wonderfully upon the silken smooth custard with its toffee shards. I would have loved the floral notes to be even stronger and will efinitely increase the amount next time around. What awesome flavors! That creme brulee must taste divine. An exquisite dessert. This is a great combination of flavors! Good luck with the names! When my husband and I adopted our girls, we had to come up with 3 names at once!! Yum! Lemon verbena is one of my favorite flavors and this looks like a great way to utilize it. Good Luck naming the baby. Good luck in your search for a baby name - it's a lot of pressure to pick a name that needs to last your little one a lifetime! At least watching Amelie wasn't a waste - this creme brulee looks yummy. I love the creme brulee combination, it sounds so delicious and herbacious. What a lovely flavor combination -- too bad chamomile gives me a huge headache but I hope to try lemon verbena one day soon. What a magnificent photo! I do love your photography. Color, texture and design are absolutely perfect. Always. This flavors in this dessert are so unusual and I bet marvelous together. Son's name were easy for us...one after my FIL and the other after my husband. My daughter Tracy's name came from the movie Philadelphia Story with Katherine Hepburn. Dessert inspired by Amelie, I love it! I like your combination of flavors, would love to try it.